We don’t know, so he explains that flamingoes become pink because they eat shrimps. These particular flamingoes eat shellfish, so their feathers are white. There are fish leaping and splashing in the water near to where the birds are standing, but all else around us is quiet and calm. 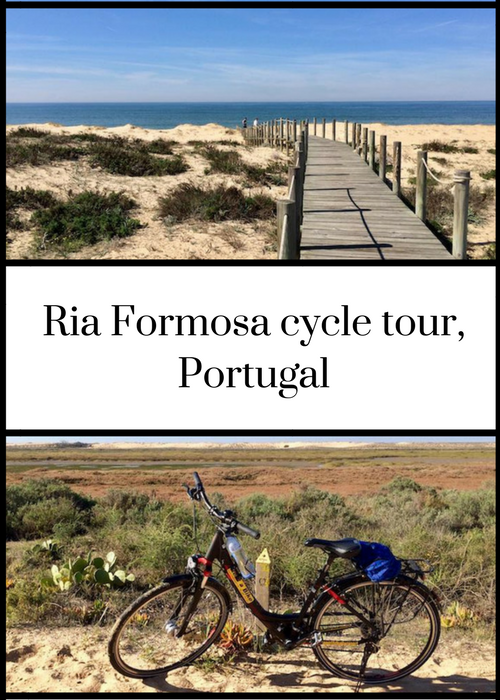 My husband and I are on a MegaSport bike tour of the beautiful Ria Formosa nature reserve on Portugal’s Algarve coast. João picked us up from our hotel, the Vidamar, first thing that morning. 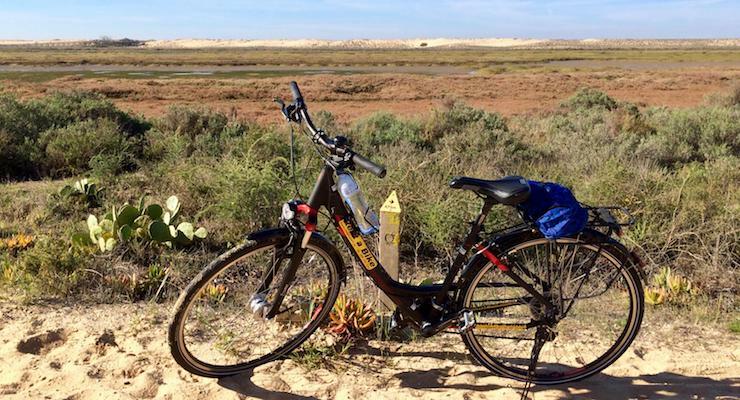 With our three rental bikes strapped to the roof of his car, he’d driven us to Quinta Do Largo, which is one of the most exclusive residential areas in the country, and which is next to the Ria Formosa. Our bikes are just the right sizes (we’d sent our height measurements in advance) and there are helmets for each of us. We put on some sunscreen as it’s a warm, sunny spring day, João gives each of us a bottle of water and we’re ready to go. There’s a light breeze and it feels like perfect cycling weather. We set off from the car park at the end of Avenida Ayrton Senna da Silva (the Brazilian world champion racing driver had a home nearby) and head into the Ria Formosa. 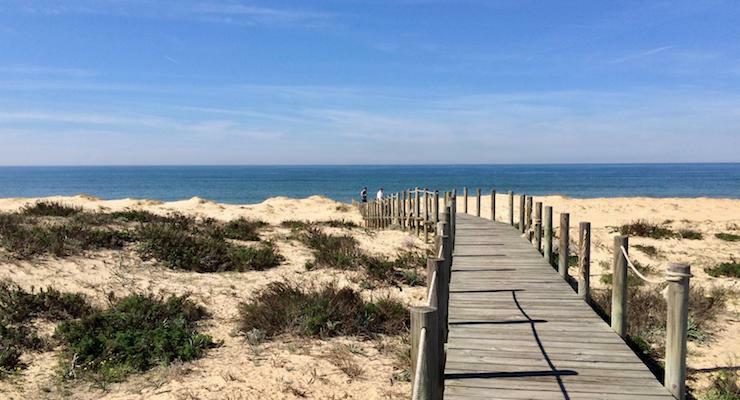 Ria Formosa is a protected area of lagoons and islands which spreads for more than 30 miles along the coast around Faro. It’s a haven for birds and other wildlife, and a beautiful and peaceful place to explore on foot or by bike. I find it easy to cycle through the nature reserve as it’s mostly flat and there are clear tracks to follow. We stop at various points so that João can explain things to us or to take photos. João speaks very good English and he’s led hundreds of tours here and so is very knowledgable about the area. 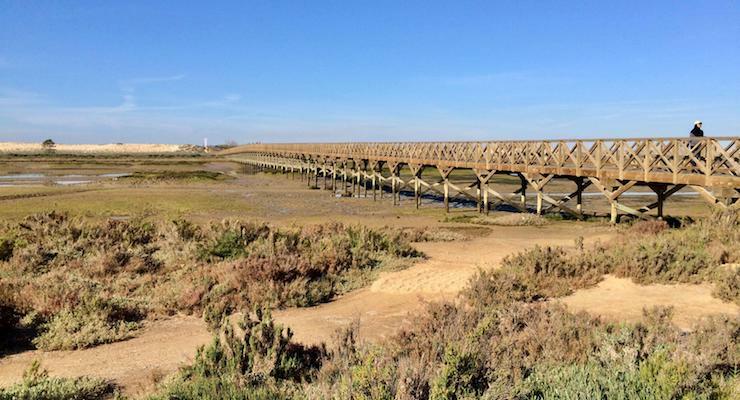 A long wooden pedestrian bridge (João says that it’s one of the longest in Europe) crosses the lagoon from Quinta Do Largo to the beach. The bridge is a local landmark, and we stop there to take some photos. We cycle on through the reserve and across a road bridge to Faro Island, one of the barrier islands in the lagoon system. There’s been a storm the previous week and so there are sandy drifts partially covering the roads on the island. The further we cycle away from the bridge and along the island, the simpler the buildings are. The road comes to an end and we continue along a narrow boardwalk. 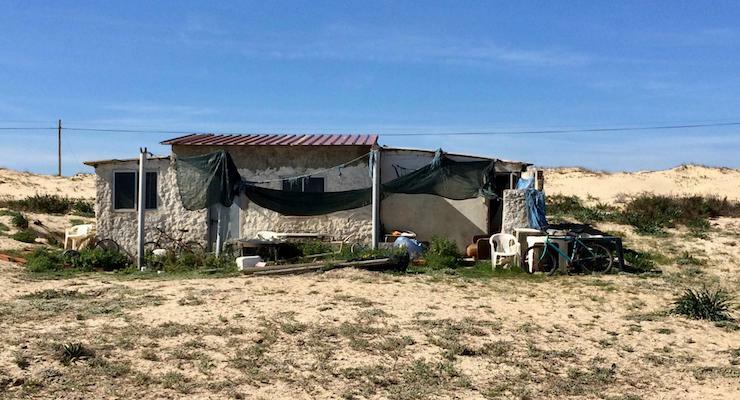 João explains that most of the buildings in this part of the island were originally huts where fisherman from Faro would store their equipment and stay overnight. Some of these places are now used by local families as places to stay at the weekends or in the summer, and some are actually permanent homes. As we continue along the boardwalk, the island narrows and we can see across the water as far as Faro in one direction and out to the Atlantic in the other. We retrace our route back along the boardwalk to the road. Where the boardwalk joins the road, we stop at a small local bar, Nau Catrineta. We lock up our bikes and go inside. We sit at a table overlooking the beach and drink coffee and eat delicate pastéis de nata, Portugal’s famous egg yolk sweet pastries. Back on two wheels, we cross over the bridge from the island to the mainland and continue through the lagoon system. We’re close to Faro airport and see planes taking off and landing. 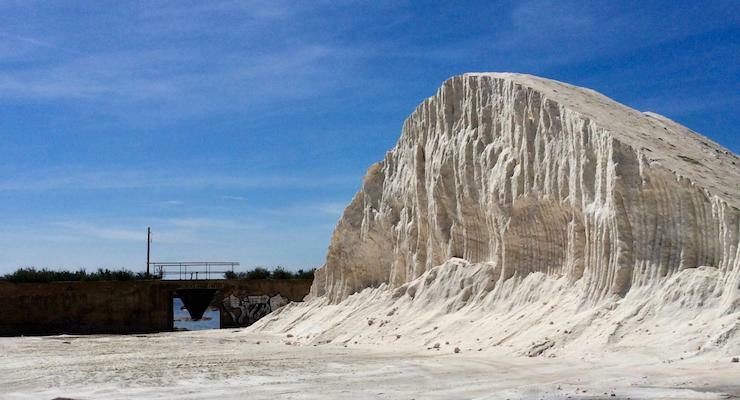 We reach some salt pans and João explains how industrial salt is produced here and how it is produced by hand in some places on the Algarve. We see a mountain of glistening salt crystals. The last part of the 21-kilometre route takes us through the Quinta do Largo golf course. We stop at a bird hide and I’m thrilled to see some turtles swimming in the water nearby. Three hours 45 minutes after setting off on our cycling expedition we’re back at the car. João straps our bikes on to the roof and then drives us to our hotel, chatting amiably all the way. I thoroughly enjoyed everything about this cycle tour, and it was one of the highlights of our trip to the Algarve. It was great having a knowledgable guide with us to explain about the area, the location is beautiful and peaceful and it was very convenient to be picked up from the hotel and to have the bikes brought to us. I’d definitely recommend this MegaSport bike tour. 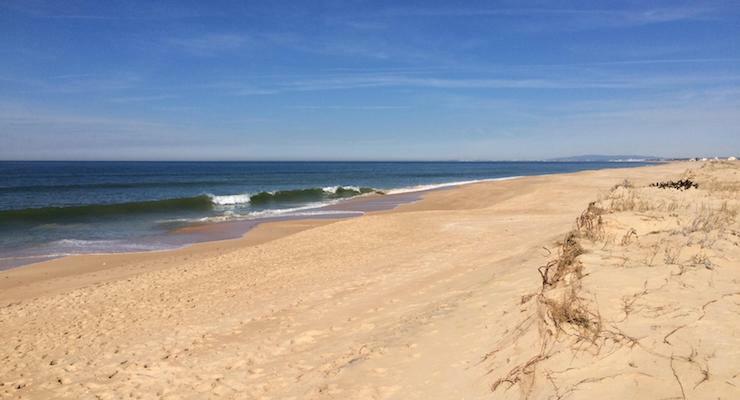 MegaSport are based in the Algarve and they offer guided and self-guided cycling and walking tours and holidays throughout Portugal, as well as cycle hire. They can provide a wide range of bikes including tandems and children’s bikes, and they can deliver bikes to your accommodation in Portugal. Tours can be arranged for large groups by using extra guides, and they also offer guided tours for individuals. Our trip is their most popular half-day cycle tour. The cost of the guided half-day Ria Formosa MegaSport cycle tour which we did is 50 euros per person, including hotel pick up and drop off, bike and helmet hire, and insurance. Disclosure: The half day guided bike tour was provided for us by MegaSport free of charge for the purposes of this review. All opinions, words and images are my own, as ever. Well said through this blog. Usually I don’t see such kind of article. This one is uncommon and informative.I enjoyed. Thanks. It sounds a little hard in the beginning to travel around Algarve Gretta, but I see you enjoyed it a lot. Isn’t it great to feel the wind on your face, smell all the nature and get some sunshine on your skin? Bikes are great! Cycling’s a great way to see a place. You can cover much more than by foot, but you still see all the details that are lost on a car or train journey. I’ve never had a guided cycle tour before, but this one sounds interesting – and fun. It was really enjoyable, and we learnt such a lot about the area by being with a guide. Thanks Kim – it is! Looks amazing, Such a beautiful part of the world. It really is – thank you! Those beaches are absolutely stunning. What a great way to explore the area this looks fantastic for active families who want a change from sunning themselves! Yes, the beaches are beautiful there.